Green Lantern Chronological reading order based on my Green Lanterns binds. A map of the trades is located in the second post. Want to see some pictures of my binds? 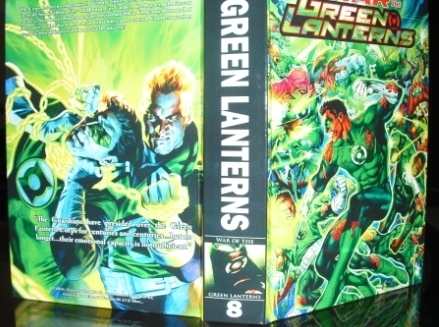 *There should be some Guy Gardner one-shots or mini series that may fit in this volume. Corwin, do you use a local bindery, or have ou found a place online? Corwin, are you collecting (and binding) anything before your Vol 1: Lanterns Recharged? gland wrote: Corwin, do you use a local bindery, or have ou found a place online? I use Herring and Robinson based out in Cali. 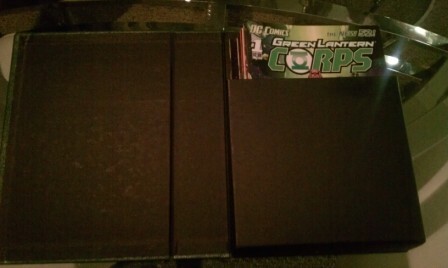 Blume wrote: Corwin, are you collecting (and binding) anything before your Vol 1: Lanterns Recharged? Oh yeah...Green Lantern volume 2 #172-224, Annuals 1-3, specials 1-2, Action Comics Weekly 601-635 and Tales of the Corps 1-3. Then for volume 3 I'm missing a few mini series and annuals. These are all things I haven't bound yet. Great list. I haven't read much before Green Lantern volume 4 but I'm trying to go back and get some old issues. There's a lot of history I've missed before Geoff Johns came on the scene. I think I may have missed something, why do you have one gigantic one labeled "current"? gland wrote: I think I may have missed something, why do you have one gigantic one labeled "current"? It's a clam shell box that holds issues. It opens like a book but has no top. Those look great Corwin. Do you collect variant covers and if so how do you bind them? Do you have two of the same issues back to back? Blume wrote: Those look great Corwin. Do you collect variant covers and if so how do you bind them? Do you have two of the same issues back to back? I get scans of variant covers I like and include them. Remember you can splice issues or remove content you don't want so there is no need to have the same issues back to back. 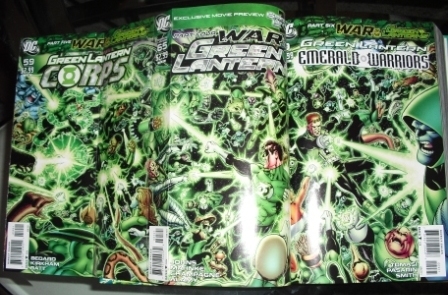 I've actually got quite a few duplicates for War of the Green Lanterns that I've taken the covers off of. Do these guys re-bind trades? Like, take two or three trades and put em together into one hardcover? gland wrote: Do these guys re-bind trades? Like, take two or three trades and put em together into one hardcover? For sure. Just try to keep it under 2 inches. Updated volume 9...caught up to current issues. As always looking for feedback/corrections. I have a couple of binds I bought from someone on the old forums that were from the old Library Binding, to see if I wanted to do some. I liked them, and started assembling a couple of massive projects... and then they were sold. I never got around to it, but I'd still like to do it. For a while afterward, I kept checking the old forums binding area, to see which of the other services would rise to the top to replace LBS, but while a couple of names repeatedly were brought up, there didn't seem to be quite the conclusive "heir to the throne" I was looking for. I should probably check out the new CGS binding forum, or Uncollected Editions Binding Forum and finally start doing this. Hey Corwin, I'm working on collecting volume 3 and I think at some point I'd like to bind them but I'm not sure yet. Maybe after you bind yours I'll take a look at the order you put them in. I'm early in my collecting but so far I've got GL #1-51 (missing #45 & #47); GL Quarterly #1-8 (missing #5); GL Annuals #1-3; GL Emerald Dawn 1&2 (complete); Mosaic (complete); Guy Gardner Reborn (#1-3) and Guy Gardner Warrior (#1-21). Before that I have Cosmic Odyssey #1-4 and Action Comics Weekly #601-605. All of these tie in together so the ordering of the bind will be very important. I look to the expert on this one (you)! I've got the whole run but I haven't read most of it. 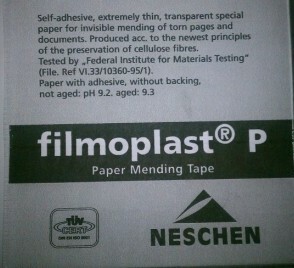 I was waiting to bind it all before reading. I'll post the map I got from someone...as a matter of fact comicbinding.com to the rescue! Volume 3 but it is missing things like Mosaic and a lot of other things. Blume wrote: Excellent thanks Corwin. No problem, let me know if you find any mistakes or think certain issues would work better in different places! For the gatefold I used this book tape to combine the three covers. In your picture Vol 1 & 2 are the fall and redemtion of Hal Jordan, what are in those binds? That is where I'm starting my GL Core Collection. Jacob wrote: In your picture Vol 1 & 2 are the fall and redemtion of Hal Jordan, what are in those binds? That is where I'm starting my GL Core Collection. Looking back I should have included the Last Will and Testament trade. 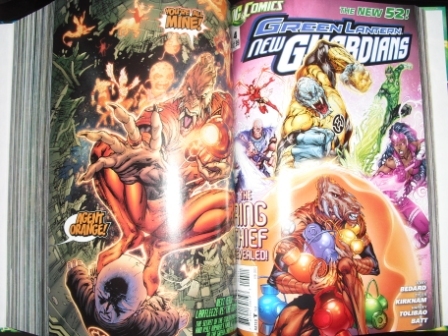 Green Lanterns Volume 9: Spectral Twilight...I'm still trying to find a name for the volume and I'm open to suggestions. Green Lantern Annual 1 starts volume 10 and unless the Zero issues obviously take place before it I think volume 9 is all set. Speaking of volume 9, I'm still working with the pacing but there really isn't a "right" order to the issues. The only thing to keep an eye out on is Bleeze...she jumps from Red Lanterns and New Guardians so much it's easy to screw that up. Besides that, it's only Guy showing up in Red Lanterns.